Malinga Bandara scooped a prize double as Woodhall Spa Cricket Club held their awards night at the weekend. The all-rounder, who will remain at Jubilee Park for a third term, claimed both the First XI batting and bowling awards. Ross Dixon walked off with with fielding accolade and Sam Evison was named the team’s player of the year. Henry Wilson won the club’s overall player of the year title, while Jack Timby was named young player of the year. Martin and Diane Wright shared the clubman of the year prize. 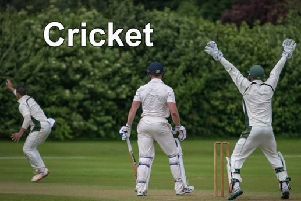 In his speech, club captain Jack Luffman praised his side’s battling qualities which saw them finish in third place in the Lincs ECB Premier Division. Afterwards, he told The News: “At the awards night I said in my speech that if you had offered us third place last April we would probably have snapped your hand off. “We lost two or three quality players and some young players came into the side. Looking forward to next year, Luffman added: “It would be lovely to finish higher. First XI: Batting – Malinga Bandara, Bowling – Malinga Bandara, Fielding – Ross Dixon, Player of the Year – Sam Evison. Second XI: Batting – Paul Timby, Bowling – Paul Timby, Fielding - Tom Dixon, Player of the Year – Paul Timby. Wanderers First XI: Batting – Etienne Botha, Bowling – Etienne Botha, Fielding – Jack Timby, Player of the Year – Etienne Botha. Wanderers Second XI: Batting - Henry Wilson, Bowling – John Temperton, Fielding – Tom Caswell, Player of the Year – Tom Caswell. Overall awards: Most Improved Player of the Year 2015 – Henry Wilson, Young Player of the Year 2015 – Jack Timby, Clubman of the Year 2015 – Martin and Diane Wright.